Iconic Italian yacht builder Riva has teamed up with fellow Italian car manufacturer Fiat to unveil a limited edition version of the popular Fiat 500. The new model was revealed by Ferretti GroupCEO Alberto Galassi during a ceremony in Sarnico at which the new Rivamare superyacht tender was also launched. Inspired by the Aquariva yacht, the Fiat 500 Riva is available as a hatchback or convertible and is finished in Sera Blue – a colourway unique to the limited edition car and one of the most popular hull colours for the Aquariva Super. The convertible also has an exclusive blue soft top while the hatchback is finished with a panoramic roof mimicking the unparalleled views offered by a Riva yacht. 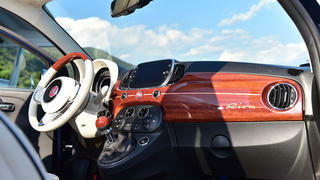 However, it is the interior of the limited edition Fiat 500 Riva that really sets it apart from the rest of the line. The dashboard is finished in the same hand-painted mahogany with maple inlay that Riva owners know and love and features both the Fiat and Riva logos. The doorsills and gear stick are also carved from a solid piece of mahogany while the seats are trimmed in luxurious ivory leather from yacht interior design brand Poltrona Frau. The first 500 cars will also feature a numbered badge which can be personalised by the owner. The Fiat 500 Riva also comes with all the bells and whistles one would expect of the luxury yacht maker including climate control, parking sensors and a seven-inch screen displaying Fiat’s HD Uconnect live services, Bluetooth calls, music streaming and voice recognition – this can also be upgraded to include 3D sat nav. 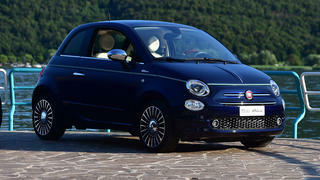 The Fiat 500 Riva will be available from the end of August with an exact price yet to be announced.